I was a huge fan of Becca Fitzpatrick's other mystery, Black Ice. I thought it was intense, suspenseful, high-stakes and I could not put the book down. I was very much looking forward to Dangerous Lies and was hoping to find another extreme page turner. 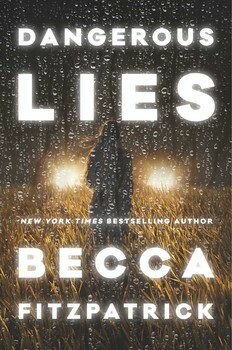 I did enjoy reading Dangerous Lies but it is a very different type of book then Black Ice. The synopsis led me to think that the book was going to have a lot of heart wrenching and life threatening action like Black Ice. I did not find that in the book. The book takes place after Stella witnesses a brutal crime which is why she is in witness protection. The premise actually had a more contemporary feel because the book is mainly about Stella coming to terms with what happened and how to move on. Dangerous Lies was not the book I was expecting but I definitely enjoyed it for what it was. The main thing that pulled me into the book was the characters. I liked Stella as a main character. She definitely was a little more immature when the book starts but as she comes to terms with things she shows a tremendous amount of growth. Chet was also a great character. He was a really good guy who had gone through hard times and was trying to come to terms with his own past. He was also the perfect love interest for Stella. The chemistry between Stella and Chet was an instant attraction. You get to see their feelings grow for each other but you also get to see them express those feelings together for a good chunk of the book. I enjoy a slow burn romance but I also really appreciate when the author lets you see the two together and in love. I also liked reading about the relationship between Stella and her witness protection guardian Caramina. Caramina does not put up with Stella's attitude when she arrives. They butted heads a lot in the beginning but ended up really caring for each other. I think their relationship was a big part of why Stella was able to grow as a person. If you are looking for a suspenseful thriller like Becca Fitzpatrick's Black Ice you won't find that here. But if you are looking for a more contemporary read with a witness protection back story I think you will thoroughly enjoy Dangerous Lies. Like you I often appreciate 'slow burn' romances best, but I saw in Hush, Hush how amazingly BF can write instant attractions! She is great at writing romances!